The staggering negative implications of salmon farming are primarily a function of the technology currently in use. The fish are raised in open net-cages which allows water among other things, to pass freely to and from the marine environment. Viruses, sea lice, bacteria, feces, feed, heavy metals, trash, disinfectants, pesticides and other chemicals freely pass from the farm to the marine environment and can harm marine life. Sea lice and other disease causing organisms are amplified and spread by the farms to infect passing wild fish. If salmon aquaculture is to remain in BC, farms need to separate their operations from the marine environment. Of all the factors that may be challenging salmon such as climate change and habitat loss, open net-cage aquaculture is likely one of the easiest problems to solve—farms need to be separated from the marine environment one way or another. In 2009, a Simon Fraser University Think Tank which included scientists from Canada and the USA concluded that a fallow of all farms on the Fraser sockeye migratory route should be exercised immediately as a precautionary measure. Unfortunately, the large scientific weight of evidence linking salmon farming to negative environmental effects, as well as these alarming recommendations have been largely ignored by government and industry. Salmon farming is a wasteful form of food production and inherently unsustainable because perfectly good wild fish such as anchovies are required as an ingredient in the feed pellets that are fed to farm salmon. Energetically it is wasteful to farm carnivorous fish species like salmon because perfectly edible wild fish have to be caught and integrated into the feed. Despite this, there may be ways in which to mitigate some of the other negative environmental impacts of this industry. For example, closed containment farming is comprised of tanks which separate the farmed fish from the marine environment and may help reduce pollution and the spread of disease. 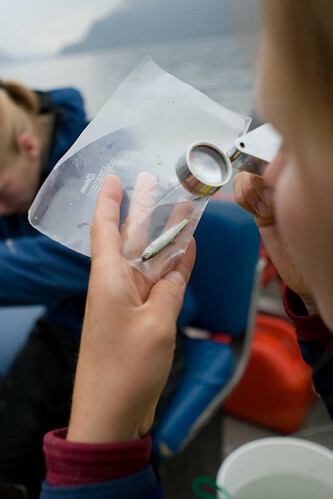 Sea Louse Infection of Juvenile Sockeye Salmon in Relation to Marine Salmon Farms on Canada’s West Coast, is one of the the first studies to demonstrate a potential role of salmon farms in sea lice transmission to juvenile sockeye salmon during their critical early marine migration. Moreover, it demonstrates a major migration corridor past farms for sockeye that originated in the Fraser River, a complex of populations that are the subject of conservation concern. Dynamics of outbreak and control of salmon lice on two salmon farms in the Broughton Archipelago, British Columbia, uses a mathematical model to demonstrate that sea louse reproduction on farms is likely the primary driver of outbreaks, not continuous immigration of lice from outside sources. Ecosystemic Effects of Salmon Farming Increase Mercury Contamination in Wild Fish, found elevated levels of mercury in demersal rockfishes near salmon farms in coastal British Columbia. Estimated Sea Louse Egg Production from Marine Harvest Canada Farmed Atlantic Salmon in the Broughton Archipelago, British Columbia, 2003-2004, clearly demonstrates just how many eggs can be produced from the number of sea lice reported on Broughton Archipelago salmon farms. evidence submissions to the Cohen Inquiry into the decline of Fraser sockeye.